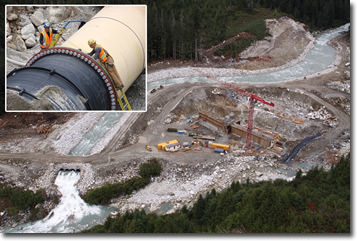 A 196 MW run-of-river hydro power project built along the mountainous west coast in British Columbia came with a multitude of challenges - including the fact that all building materials and equipment had to be barged in to the site. 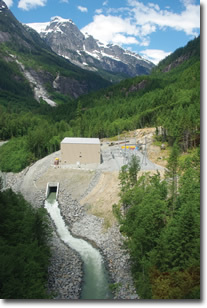 Plutonic Power Corporation and its partner, GE Energy Financial Services, have flipped the switch on their $663 million, 196-megawatt, Toba Montrose run-of-river power project, taking advantage of the rivers and steep elevations along the mountainous British Columbia coast. The project site is 120 miles up the rugged west coast from B.C. 's largest city, Vancouver. As the largest source of independent renewable power in the Canadian province of B.C., the Toba Montrose project was built in an environment that can only be described as unforgiving on a number of fronts. In a way-though on a much smaller scale-it resembled the magnitude of challenges presented by such renowned engineering/construction projects as the Panama Canal. First, there was the extreme rainforest weather, which included weeks of intense heat, steady rain, or heavy snowfall. Then, there was the mountainous environment, with no access to the work site, except by boat or plane. All the building materials and equipment had to be barged in. To even step on the property, the company had to negotiate with three local Indian-or as they are known in Canada, First Nations-communities on whose pristine land the rivers are located. "The remoteness was a really tough challenge," says Bruce Ripley, president and chief operating officer of Plutonic Power. "There are no roads from civilization leading into the Toba Valley. We were dealing with 1500 meter high mountains with very steep slopes, and in terms of the very hot, dry summers, you had forest fire risks. "You can also have incredibly wet spring and fall seasons, and then winter can involve a lot of snow. There were several times when it snowed three feet overnight." Negotiating access and compensation with local First Nations groups was no slam-dunk. It involved careful discussions with three separate groups that first required establishing a level of trust. "As with any project where you are going to be building in somebody's backyard, the first reaction is, hey, wait a minute . . . what's going on around here?" says Ripley. "But through a steady effort of consultation and showing up with the same people time after time after time, we were able to develop good relationships with the First Nations, and it is something that we work hard at." Ripley added that Plutonic Power developed a contractual relationship called an Impact Benefits Agreement (IBA) for each First Nations community. It contains various elements of compensation for construction, compensation for operations, and then training and employment opportunities as well. For example, the Klahoose First Nations and the Powell River School District created a partnership to manage the construction camp and food services. The school district was able to use the construction camp to provide work experience opportunities. They also used the contract funds to support trades training in such areas as welding, carpentry, and automotive. As if the weather, terrain, and negotiations with landowners weren't enough of a challenge, add the element of a high level of environmental sensitivity concerning the project. Ripley says there was a lot of interest among many non-governmental organizations (NGOs) concerning the East Toba Montrose project, and the B.C. government was also concerned about the potential environmental impact. "The project required an independent environmental monitor to be present throughout all construction, and they reported to the B.C. Ministry of Environment," says Ripley. "They were involved in the sign-off of all construction plans and even down to daily plans." The federal Department of Fisheries and Oceans was also involved and their authorization was required, as the East Toba River is a salmon-bearing river. 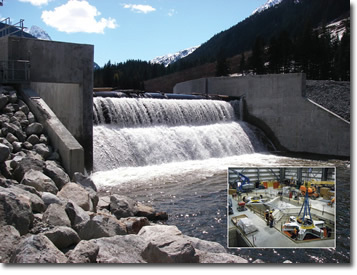 Plutonic Power took care to locate its project components upstream of natural fish barriers, such as large waterfalls that would preclude the migration of salmon. Doing so made the project much more acceptable from an environmental standpoint, as the company worked hard to minimize its impact on the salmon population. This included the installation of the largest Coanda screen in the world, provided by two companies, Norris Screen and Manufacturing, a division of the Elgin Equipment Group of Illinois and Cook Legacy, based in Ohio. This type of screen shears off layers of river flow while allowing remaining water and debris to travel downstream. The 25-screen span stretches nearly 200 feet across the Montrose Creek. Plutonic Power was also careful to monitor sediment runoff into rivers from recently excavated areas during periods of heavy or prolonged rainfall. Additionally, where there was an opportunity to improve on the aesthetics at a reasonable cost, they took it. "The long-term footprints that you see on these projects are the intake structures, the power house structures, the local switch yard, and the transmission line," says Ripley. "That's about it for visual impact." One of the attractions of run-of-river power generation is that it does not require storage of large amounts of water as in conventional hydroelectric projects and their dams, but it does have to rely on what nature provides in terms of runoff. Despite all these formidable challenges, construction of the Toba Montrose project was completed ahead of schedule with both projects on line by July. But it still begs the question of why Plutonic Power would go to all the trouble in the first place. Powerful motivators for building the project included the fact that British Columbia is a net-importer of power, and Plutonic Power was able to negotiate a 35-year electricity purchase agreement with provincial utility B.C. Hydro. B.C. has set an aggressive renewable energy target of becoming electricity self-sufficient by 2016, using 90 percent clean domestic generation sources. Another powerful motivator was the attractiveness of the terrain for run-of-river power generation and the level of technological advancement pertaining to this type of power generation, whose fundamentals date back at least a century. Thirdly, the project is fairly close to the population and load demand center for the province, which is the city of Vancouver and the surrounding area. "Run-of-river technology makes great sense for that area," says Ripley. "We have got mountains right up against the ocean, and as a result of that, we get a combination of high precipitation, which gives us runoff, and then we get a big elevation difference. The combination of the high heads and the high flows make it great for generating hydroelectricity." The runoff profile for the project is a combination of rainfall, snowmelt, and glacial melt. The flow varies. In the winter, there are 3 to 4 cubic meters of flow per second heading to the powerhouse, whereas in late summer it is between 20 and 30 cubic meters per second. The Toba Montrose project consists of two sites, the East Toba River and the Montrose Creek sites. There are small intake structures upstream at high elevations on small rivers and large creeks, which divert a portion of the water into buried steel penstocks. A penstock is a big pipe, which on these projects range in diameter from 2.1 to 3.3 meters. Some natural water flow from rivers and creeks is diverted around the intakes and maintained at all times to support aquatic life. The penstocks from each location are about five kilometers long, with the elevation difference being 580 meters for Toba and 470 meters for Montrose, with the water eventually flowing through two surface powerhouses, exiting through tail races back into the natural water course. Plutonic Power has constructed a 155-kilometer, 230 kV power transmission line to connect with the existing BC Hydro power grid, with enough extra capacity built in to support another run-of-river power project the company is developing in the area. Specifically, this is the Upper Toba Valley Project, a 124-megawatt run-of-river power project involving the Upper Toba and Jimmie Creek sites. It is also a partnership between Plutonic Power and GE Energy Financial Services. They have signed a 40-year electricity supply agreement for this project with BC Hydro. "The current government we have in B.C. made it a priority to develop a renewable energy industry," says Ripley. "And that, coupled with the fact that B.C. has a good long history of private power development, makes it a pretty good environment." Ripley himself entered the private power development business from a position of strength, having spent 16 years with BC Hydro, holding the position of vice president, Engineering from 2004 to 2006. The Toba Montrose run-of-river project is the largest source of independent renewable power in the Canadian province of B.C., and it was built in an environment that can only be described as unforgiving on a number of fronts. Worley Parsons was retained by Plutonic Power as the overall project and construction manager on the Toba Montrose project. The project designer was Knight Piesold. The main contractor was Peter Kiewit Sons. Turbine generators were provided by Andritz, and transmission lines were constructed by two subcontractors, Allteck Line Contractors Inc. and Henkels & McCoy PEI Inc.
Texcan supplied the transmission conductors, Siemens provided the transformers, and Rutter Hinz supplied the protection and control systems. Plutonic Power and GE Energy Financial Services are in the process of diversifying their renewable energy holdings by also developing the 144-megawatt Dokie Wind Project located in northeastern B.C. near Chetwynd, and they are already considering an expansion of that project. "To me, what is special about what we have done is that we have built the largest run-of-river power project in British Columbia, and at the same time, we are also building the largest private wind project in British Columbia," concludes Ripley.